There are few coins in this world more popular than the Gold American Eagle. 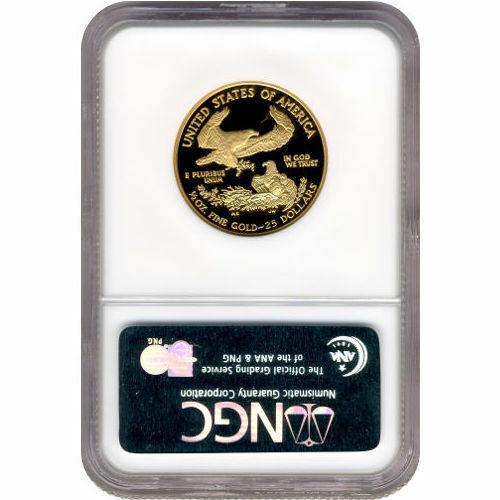 Struck each year by the United States Mint, these coins are available in bullion, proof, and burnished versions, with four weights available in bullion and proof. 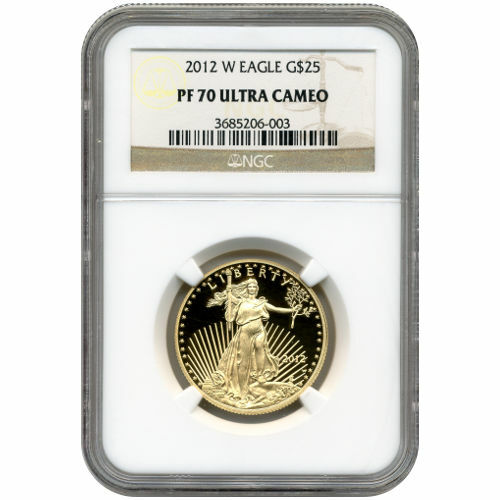 The proof is a collector’s version of the coin, and right now, Silver.com offers the 2012-W 1/2 oz Proof Gold American Eagle in perfect condition. Ships to you in an NGC protective plastic slab. Consists of one-half troy ounce of 22-karat gold. Available with an Ultra-Cameo finish. Features a “W” mint mark. Congress is the only government body in the United States with the power to authorize coin production, circulation or commemorative, and issue a face value to the coin. The Gold American Eagle coin was authorized by Congress in 1985 with passage of the Gold Bullion Coin Act. The act authorized a coin series that originally featured two versions, with the bullion including four weights and one weight in proof. Congress added additional language to the bill that stipulated all Gold American Eagles must contain only gold sourced from within the United States. On the obverse side of each is Augustus Saint-Gaudens’ image of Lady Liberty. Created in 1907, the design originally appeared on a coin that Saint-Gaudens’ did not live to see. The artist and sculptor died just months before the US Mint began production. The reverse bears Miley Busiek’s unique depiction of a family of bald eagles. Her creation shows a male returning to the nest, where a female stands vigilant watch over the nest and the hatchlings within. Busiek’s design is featured only on the Gold American Eagle coin. All these coins have a perfect PF70 grade from the NGC. Each has its full, original mint luster and no blemishes, hairlines, or contact marks. Ultra-cameo coins have a frosted design set overlaying a deeply-mirrored, clear background field. If you have questions, Silver.com associates are available to answer them. You can reach our team members on the phone at 888-989-7223, connect with us online using our live web chat, or send your questions to us via email. If you are looking for similar products, be sure to check out our selection of Gold Austrian Philharmonics.